Eliminates mold & mildew stains. Dissolves soap scum. Kills odor causing bacteria. Non-toxic. Plant derived formula. No bleach, harsh chemicals or fumes. 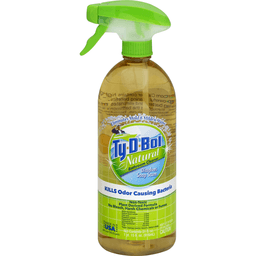 Ty-D-Bol Natural Bathroom Cleaner contains high performing plant based ingredients that deliver powerful cleaning benefits. The gentle but highly effective formula kills odor causing bacteria and eliminates mold and mildew stains. Cleans multiple surfaces throughout the bathroom including soap scum from shower stalls and doors, bathroom fixtures, bathtubs, cabinets, chairs, countertops, floors, sinks, tables, toilets, urinals, walls and other non-porous surfaces. Safe for the environment. Free of chlorine, petroleum-based solvents, phosphates, strong acids, dyes or synthetic fragrances. No rinsing required. No harmful residue left behind. This product has not been registered by the United States Environmental Protection Agency. Willert Home Products represents that this product qualifies for exemption from registration under the Federal Insecticide and Fungicide, and Rodenticide Act. Tub & shower. Sink. Toilet. Made in USA. with over 75% US parts. Clean you can see! Cleans with every flush. Powerful detergents help keep your toilet bowl clean in-between scrubbing. Lavender detergents provide a continuous clean you can see. Cleans & deodorizes with every flush. Protective wrapping - no direct contact with hands or skin. Bowl water not harmful to children or pets (It is not recommended that pets drink toilet bowl water). Safe for plumbing & septic systems. 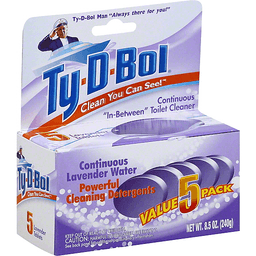 www.tydbol.com. Continuous lavender water. Helps keep your toilet bowl clean in between scrubbing. Made in USA with us & imported materials.